This week’s competition is brought to you by The Blue Jeans Bar which is not just a boutique, it is a safe haven for people in search of a cozy atmosphere to find a perfect pair of blues. 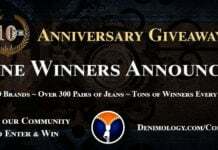 The winner of this giveaway will get $300 to spend on any of the 20 men’s and women’s brands including Genetic Denim, Citizens Of Humanity, Joe’s Jeans, 7 For All Mankind, True Religion and Rock & Republic. The winner will also be able to call upon the help of the “bartender” to help select the perfect pair of blues. The winner can choose their prize by going into one of the The Blue Jeans Bars in San Francisco, Chicago, Dallas, Denver, San Jose or Santa Monica or they can make their selection (with the help of the “bartender”) over the phone. Please note that by entering this competition you are agreeing to receive email newsletters from both Denimology and The Blue Jeans Bar. Only one entry per email address will be accepted and the closing date for entries is Feb 15th, 2010.